Summary: In Google Adwords you can optimize conversion rates using gender targeting. Learn how to squeeze more leads out of your PPC spend by targeting high performing demographics singly or in combination. Last time we explored optimizing your PPC campaign with age range targeting. We found that middle-aged people tended to convert better, for a particular client. 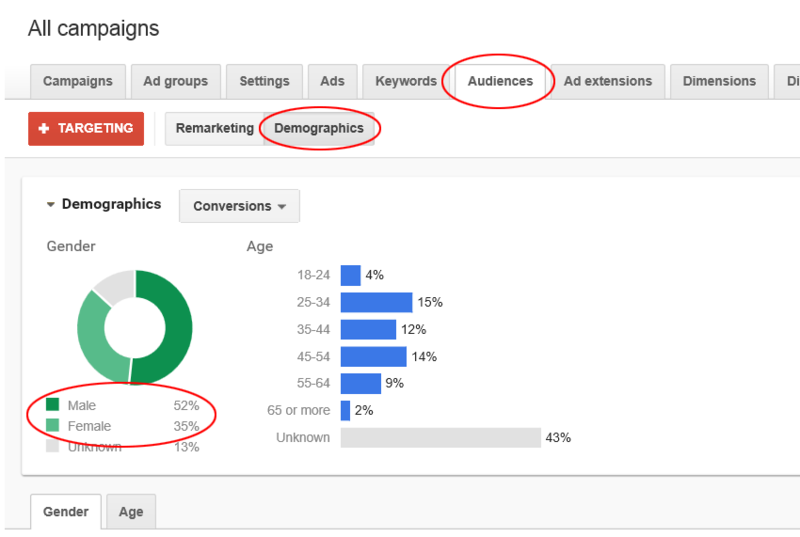 In Google Adwords you can also target demographics by gender. Studies have shown that men and women tend to browse and shop differently on the Internet. Let's look at how you can use differences in gender behavior to optimize bids to boost PPC conversion rates. 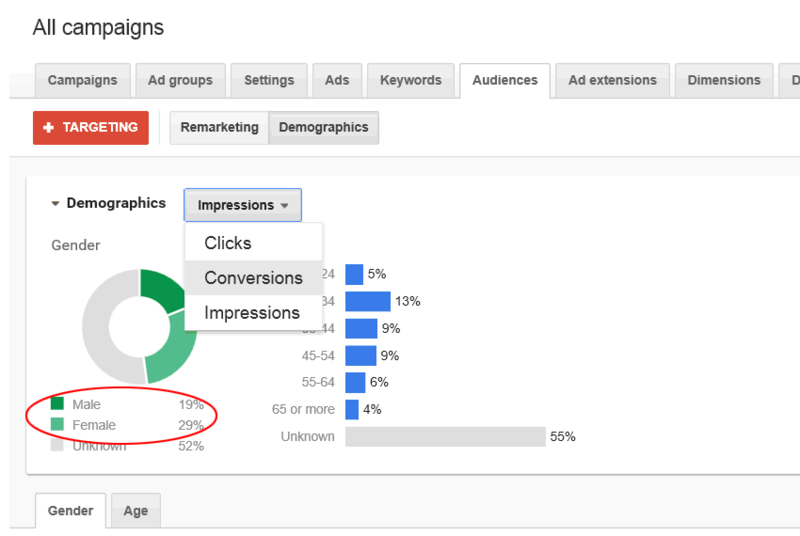 To target by gender in Google Adwords select Campaigns, and select the Audiences tab (see Figure 1). Next select the Demographics button to the right of the +Targeting button, and select the Gender tab next to the Age tab. Note that Google uses self-selected genders, where Google users enter their gender and age into their account profiles. Not everyone enters every demographic requested, thus the "unknown" category. On first glance, one interesting thing about this account is while more females visit than males, more males convert than females. Figure 2 shows that females create 1.5 times more impressions than males (at least the visitors we know the gender of). Figure 1 shows that men convert about 1.5 times more than females. Something is strange here in mudville. We'll see the reason for this later on in this article. After selecting gender in demographics, AdWords lists the performance for each gender in each ad group. To get a better overview of how each age range performs overall, select the Account View tab (see Figure 3). The account view shows the overall performance of each gender in your entire account. Overall men convert about 2.4 times more than women (8.23% vs. 3.47% for women). Men also cost less than half per conversion than women. In the ad group view you can target specific genders for bid adjustments. In this case we bumped up the bids for the male persuasion for both the dentist call only, and the porcelain veneers call only campaigns (see Figure 4). In both campaigns, males converted 2 to nearly 3 times more than females (19.89% for males, 6.67% for females in the dentist campaign for example). These tweaks will boost the overall conversion rate of this PPC campaign. Google Adwords allows you to combine demographics to see which combination (gender and age in this case) has the best performance. The "view demographic combinations" slider defaults to off. Setting this feature to on finds the best combination of gender and age ranges (see Figure 5). In the dentist call only campaign, males ages 35-44 had the best conversion rate. Like the age and gender demographics do individually, you can select "account view" for a combined demographic performance overview (see Figure 6). The account view for the combined age and gender shows that males in the age range of 35-44 tend to convert the best for this account. You can target specific genders in Google Adwords to optimize conversion rates. By tweaking the bids on high performing genders, you can tilt your campaigns to those folks more likely to convert. You can also view combinations of demographics to see which combination (males or females in different age ranges) converts the best. This Manhattan New York cosmetic dentist volunteered his AdWords campaign as the subject of this article. Discusses the different ways men and women shop online.